David Therriault, an associate professor of educational psychology in the College of Education, never seems to find enough time to sit down. UF COE education psychology scholar David Therriault is happier about his research being recognized than he is about any personal accolades that result from his studies. The UFRF professorships are given to tenured UF faculty members who have distinguished records of research as a way to recognize their contributions and provide incentives for continued excellence in research. Thirty-three UF professors were named this year, and each will receive a $5,000 annual salary supplement and a $3,000 grant to support his or her research. Therriault is an associate professor of educational psychology in the COE’s School of Human Development and Organizational Studies in Education (SHDOSE). 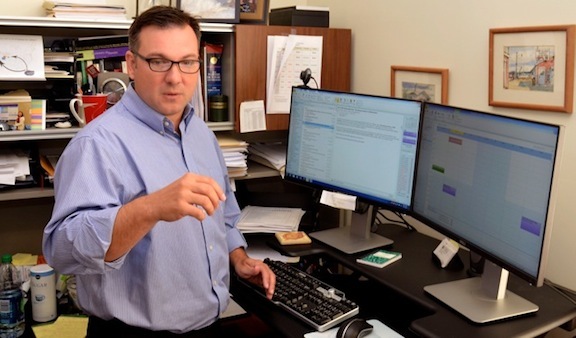 His main academic interest always has been the psychology of education, which is why his work at UF has focused on the empirical study of the mental processes that shape the way we learn. Such nuances include the representation of text in memory; comprehending time and space in language; the link between attention and intelligence; the use of perceptual symbols in language; and problem solving in engineering. SHDOSE director Harry Daniels might disagree. “There is clear evidence that Dr. Therriault is an active and productive scholar, and that his scholarship informs others who conduct similar types of research,” Daniels wrote in a letter of recommendation for the professorship. Daniels’ letter also pointed out that Therriault’s published articles in scholarly journals – which total more than 25, including 14 in the past five years — have had a “high impact rating” on their audiences. “The interdisciplinary nature of Dr. Therriault’s research deserves special recognition,” Daniels wrote, explaining that Therriault has developed relationships with UF College of Engineering faculty to address some of the critical issues of scientific problem solving within the field of engineering. The objective in working with the College of Engineering is to measure empirically how two seemingly disparate disciplines can benefit each other, according to Therriault, who received $805,000 in grant money to examine how engineering students solve open-ended problems. Therriault also received an $83,000 UF research opportunity grant in 2011 that enabled him to develop a kindergarten-level reading disabilities screening battery called the Kindergarten Cognitive and Reading Assessment Tool for iPad (K-CRATI). The assessment tool is being designed to allow educators to effectively catch at-risk students early in their elementary schooling. “If past performance is truly the best predictor of future behavior, there is every reason to believe that Dr. Therriault will utilize the [research professorship] to further his agenda,” Daniels concluded. Therriault received his bachelor’s degree at the University of New Hampshire before earning a master’s degree and his Ph.D. – both in cognitive psychology — from the University of Illinois at Chicago. He joined UF’s education psychology faculty in 2004. Source: David Therriault, UF College of Education; therriault@coe.ufl.edu; phone 352-273-4345. Media Relations: Larry Lansford, director, College of Education Office of News and Communications; llansford@coe.ufl.edu; phone 352-273-4137. Writer: Stephen Kindland, College of Education Office of News and Communications; skindland@coe.ufl.edu; phone 352-273-3449.